A friend posted this graphic to my timeline and invited my comments. Once I stopped laughing, I offered them. When I looked at the complexity of this, I then became sad; sad for the poor miserable soul who wasted half their life investigating and plotting it out. I’ve mentioned before that I spend a lot of time playing online games on my phone, but that is truly a better use of time than this nonsense! These people need a life! Seriously! This is ground I’ve gone over in my previous End Times prophecies 1 & 2. However, my journey is not complete yet… I’ve had some things I thought were set in concrete smashed to bits by my own investigations, and I’m entering a new era of discovery in my theology and my life. This was repeated in Acts 2:20 when on the day of Pentecost the Apostle Peter spoke to the crowd and quoted this section of Joel’s prophecy. The premise has now been proposed that it speaks of lunar eclipses when the moon turns a copper colour, sometimes a bit more red depending on the physics of it. These lunar eclipses occur in occasional tetrads of four spread over two years. That much is scientifically, astronomically true. Then it is stated that these tetrads have only occurred eight times since the time of Jesus, and they have all coincided with the Jewish feasts! Rubbish! The whole eight tetrad thing is deception from the start (yes, I will use the word deception with no apology) since there have been 64! Yes, 64!! The Jewish feasts only occur at full moons, and lunar eclipses can only occur at full moons. Do the maths and work out the probability (roughly one in 6 of the 64 should ‘coincide’ with the feasts) and the eight tetrads that happen to occur with the feasts are actually less than coincidence, they’re predicted! And not by prophets, by any astronomer with a slide rule! The moon orbits the Earth every 27.322 days, so like a clock it is precise, measurable, calculable; it meters out days and months inexorably and inevitably, so the ‘wonderful’ figures and sliding scales in the graphic above are nothing more than the waxing and waning of our single natural satellite, that has always maintained control of our tides (and the hearts of romantic poets and minstrels). I could jumble and juggle the maths myself to get any sort of graph I like, but I’d have no desire to get into it; reminds me of that Jim Carrey film, ’23’, that I’ve only ever seen trailers for. He becomes obsessed with seeing 23 everywhere, then sees 2s and 3s, then finds a 6 and says ‘that’s 2 times 3″ or a 5: “that’s 2 plus 3!” and so on… it’s clear he’s going mad. As I said, this is all based on just one verse… no, hold on, it’s actually a half verse! What about ‘the sun turned to darkness’? If we’re talking about lunar eclipses, then there must also be a solar eclipse, yet the two can never occur together – we’d need two moons for that! (In case you haven’t studied astronomy from a child like I did: lunar eclipses occur when the moon is behind the Earth, solar eclipses occur when it’s in front of us, between the Earth and Sun). Yet nowhere do these people even mention the sun! Many heresies are borne from one verse (or more often actually half a verse) taken out of context. And look at the end of the verse, which is what we’re meant to be looking to happen: if it’s a sign for the coming of ‘the day of the Lord’ then why would God give us that sign eight times over 2000 years? Is that not a bit deceptive? Those who saw the ‘first tetrad’ (whichever one of the 64 that was!) would have been deceived into thinking ‘he’s coming soon!’ and so would those who saw the second, and the third… how would anyone know which one was ‘IT’? 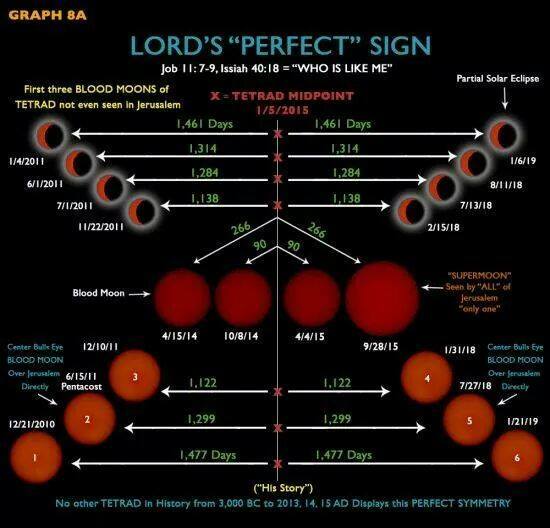 If you read this and still wish to go after the ‘Blood Moon’ stuff, be my guest, you’re entitled to, but please don’t go around trying to tell others all about it; you’ll only drag them down with you into a useless pursuit after nothing and just make a fool of yourself (and much more importantly, my Lord Jesus!). Just in case you think I’m being smug about this, let me say that I’ve been here before myself. I read ‘The Bible Code’ some years ago and was taken in by it, stunned at what was being shown. I should have known better: there is no hidden code in scripture, waiting for a computer age to find it out; that’s the age-old teaching of Gnosticism, the idea that there is a higher, ‘hidden knowledge’ that only an elite can tap into. It’s also a general problem when a small group of believers think they’ve found some ‘great truth’ in the Bible and end up sneering at those who ‘just can’t see it’ – it’s a common trap of conceitedness. The Bible Code was later debunked when some hoax-slayers managed to get the same ‘results’ from the works of Jane Austen! Jesus actually warns us about anyone who says “the time is near”! Does this mean all the preachers who do the usual round of ‘end times’ sermons? Something to think about, surely. I believe in the Second Coming, absolutely, but I also believe the words and warnings of my Lord when it comes to trying to figure it all out. Like I said before, watch for the signs as they happen, but do not predict! So please, stop doing that, or following those who do, right now! Free yourself. Still like that ‘Blood Moons’ stuff? Worried about admitting that you wasted so much time reading it and believing it? The time I ‘wasted’ reading rubbish like ‘The Bible Code’ I treat as lessons for me that stopped me listening again to things like this. Jesus said we will not know the day nor the hour…I guess people lack reading comprehension. I’m glad you don’t! ← Biblical literalists don’t exist!